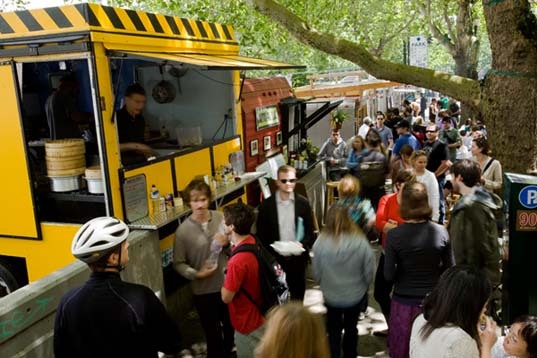 While food carts in Portland have been making headlines for the diversity, quality, and value of street food – having been ranked #1 in the world by CNN Travel and U.S. News Travel – the real story isn’t about the food, but the urbanism. Organically and haphazardly sprouting up on parking lot perimeters, these tiny carts are famed for delivering a diversity of delicious food at an affordable price point. What’s different about the Portland model is their location: the carts are camped on parking lots, vacant lots, or otherwise undeveloped property. The result is that the food carts in Portland act like tiny retail spaces on properties that might not otherwise have development, particularly in this down economy. And because of their small size, they allow entrepreneurs without a lot of resources to get started in business – essentially, a DIY approach to business. What’s even more interesting is that these carts are challenging the nature of development itself. On the one hand, these pint-sized spaces are becoming more attractive to other entrepreneurs (such as clothing shops) and, on the other; food purveyors are taking a cue from vendors and downsizing to micro-restaurant spaces. These trends suggest that a move toward smaller and perhaps even temporal retail spaces. While food carts in Portland have been making headlines for the diversity, quality, and value of street food – having been ranked #1 in the world by CNN Travel and U.S. News Travel - the real story isn’t about the food, but the urbanism. Organically and haphazardly sprouting up on parking lot perimeters, these tiny carts are famed for delivering a diversity of delicious food at an affordable price point. What’s different about the Portland model is their location: the carts are camped on parking lots, vacant lots, or otherwise undeveloped property. The result is that the food carts in Portland act like tiny retail spaces on properties that might not otherwise have development, particularly in this down economy. And because of their small size, they allow entrepreneurs without a lot of resources to get started in business – essentially, a DIY approach to business. What’s even more interesting is that these carts are challenging the nature of development itself. On the one hand, these pint-sized spaces are becoming more attractive to other entrepreneurs (such as clothing shops) and, on the other; food purveyors are taking a cue from vendors and downsizing to micro-restaurant spaces. These trends suggest that a move toward smaller and perhaps even temporal retail spaces.